During each wedding that I have the honor to photograph, I have a chance to capture many important family events. I meet a lot of people and photograph many family members including children. As a wedding photographer in Danbury in Connecticut I have also specialized in photographing children. My children portfolio consists of photographs of children of many ages, from newborns to High School Seniors. My professional style of photographing children can be best described as a mix of fine art and modern photojournalism. Having two kids of my own, I understand very well that children rarely like being photographed. I know how to approach them to capture their true personalities and emotions. As a children photographer in Danbury, I am very excited to have met many families from surrounding areas: Bethel, Newtown, Norwalk, Stamford and Greenwich. I love photographing children and their unique personalities. The photograph of this little girl was taken during the most recent wedding in New Haven, CT. The venue's name is Anthony's Ocean View and it is located in New Haven in Connecticut. 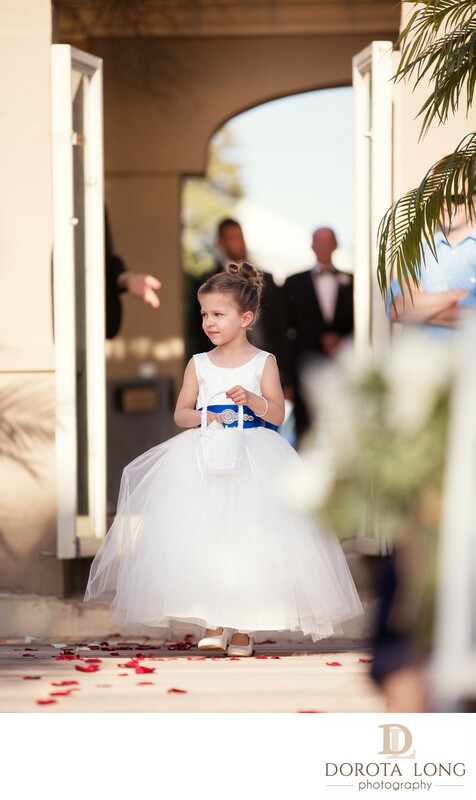 The little girl was the only flower girl present at the event and we can say she definitely stole the heart of each of the wedding guests. Since one of my specialties, besides wedding photography, is children photography, I always look forward to photographing children during each wedding.